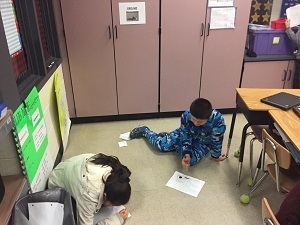 Our annual Math Olympics was held on February 28th. This yearly event brings parents and students togeter to play fun math games. 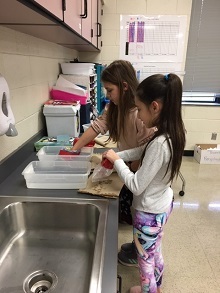 "Science on the move: Water Cycle Challenge"
Students in Mrs. Johnson’s 5th grade class recently began learning about the water cycle. As part of their learning journey, they completed a water cycle challenge where they had to start at one station in the room, read a card at that station and follow it’s directions to the next station. Each station represented one part of the water cycle (Ocean, Atmosphere, Clouds, Ground, Plants, Rivers and Lakes, and Snow). 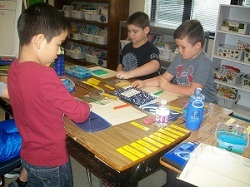 During science, Room 360, completed a collaborative activity where students created their own islands. Earlier in the week the class learned the different types of land-forms that are found throughout the world. November 11 was Veteran’s Day Celebration in our country, and schools and most government businesses were closed. 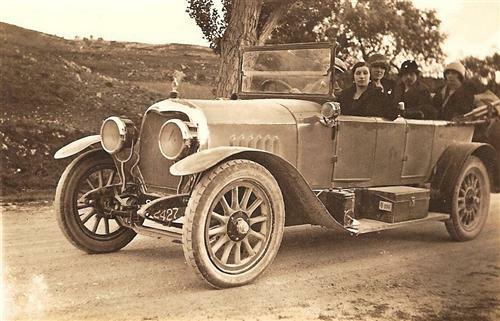 This year was the 100th anniversary of the ending of hostilities during WWI - - Armistice Day. 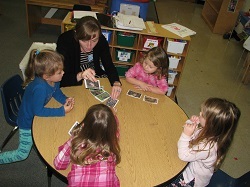 Union Pre-K students were treated to learn about animals favorite foods from a guest presenter Ms. Chelsea Sloggy. Union Elementary 4th graders have been working hard researching a college from North Carolina. Mrs. Jarzombek’s class collected the most box tops during the box top competition. They were able to have a visit from Kevin the Fire Marshall and the fire dog Camden. 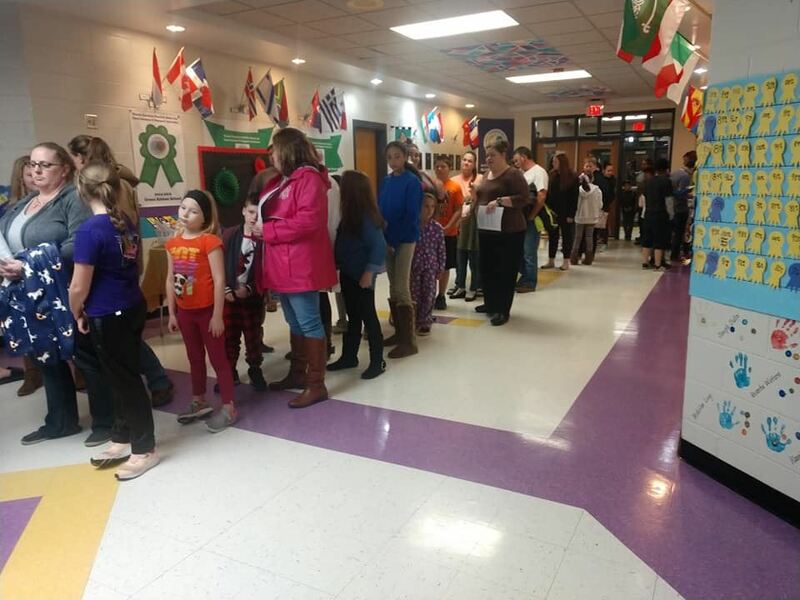 Union Elementary Literacy night, which was called Camp-Read-A-Lot. Students and parents attended a presentation dealing with literacy at their child’s grade level. 2nd grade students have spent the first few weeks focusing really hard on learning the rules and procedures. We have gotten to know each other by doing activities where we shared information about ourselves, our families and our friends. Students have learned about classroom expectations as well. 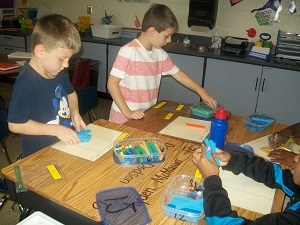 In Ms. Marban’s class we have begun a new science unit and have been working on states of matter. We have learned to identify a solid, liquid, and gas. Where: Union Elementary School When: Friday, October 19, 2018 Time: 6:00p.m. - 8:30p.m. Gerri Thierbach, received a GEM award this year! 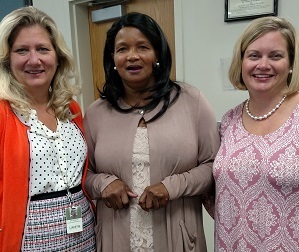 The GEM, Graduates Esteeming Mentors, Awards are held every year at Forest Hills High School. This is an award in which the top ten students in the senior class choose a teacher that has had a major impact on them during their years at school. 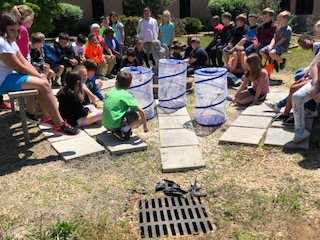 As part of our previous science unit, 2nd graders studied Life Cycles. The objective of this unit was to ensure that students understood the life cycle of animals, starting from birth, growing into adults and any changes that take place in between. In order to help students truly understand this development, we hatched Butterflies in our classrooms. 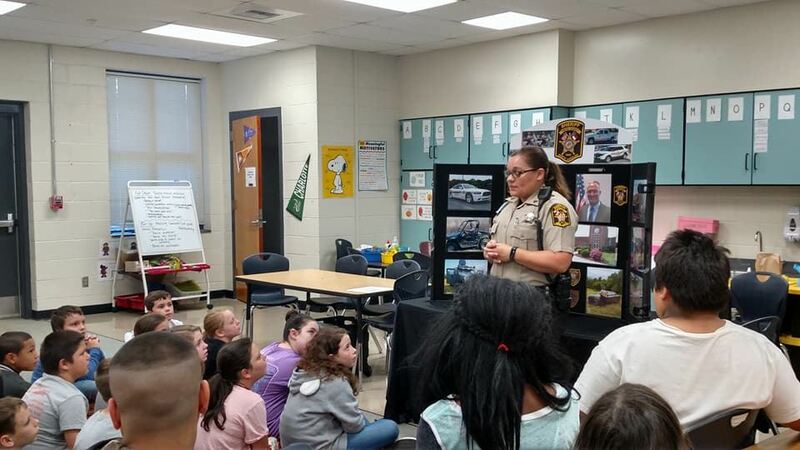 On May 4 Union Elementary experienced their first Career Day. We had four guests visit our school to speak to the third through fifth grade students about different careers. Our speakers consisted of a nurse, air technician, veterinarian, and a sheriff. 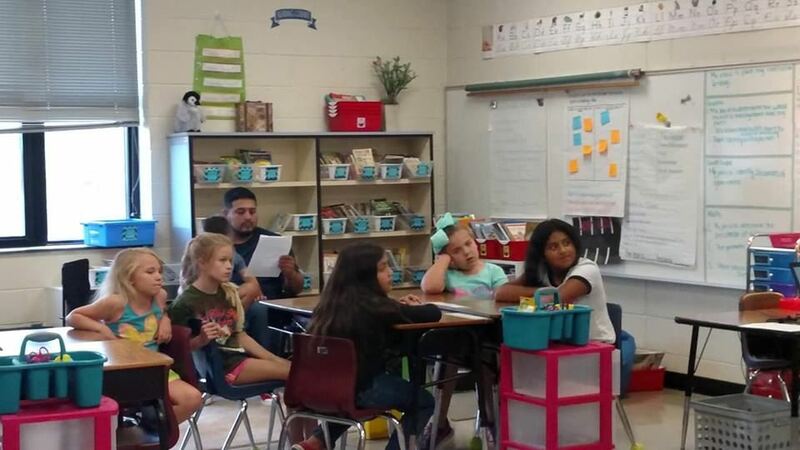 Ms. Hill’s third grade class has been working on their poetry unit for the past two weeks. 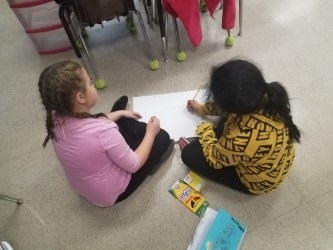 During this time, students have learned what the elements of poetry are, how to find them in a poem, and how to use those elements in their own writing! 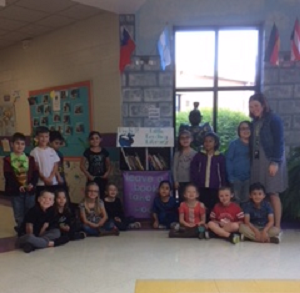 Union Elementary school has just gotten its very our Little Lending Library. There are two, one for Pre-K through 2nd grade and one for third through fifth grade. The students love having the access to books. 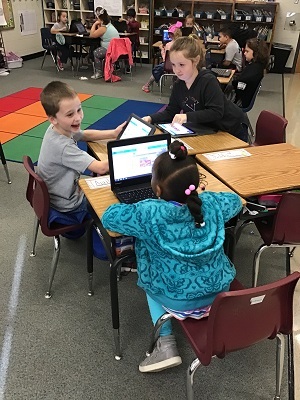 First grade students have been enjoying the county wide implementation of Tutor Mate and interacting with tutor volunteers from Novant Health. Tutor Mate is an online reading buddy program that reinforces reading fluency, comprehension and word study skills. 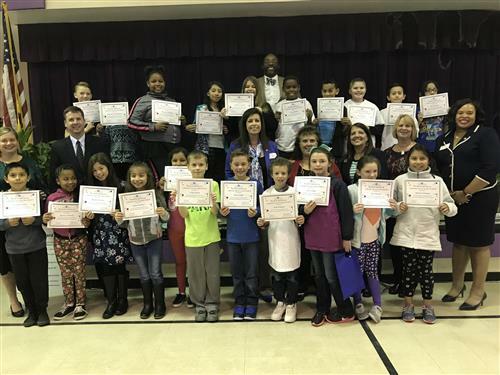 Union Elementary graduates UCPS' inaugural class of the Young Bankers Club Thirty Union Elementary students recently graduated from the Young Bankers Club, a financial literacy program that teaches the importance of education, finances and personal responsibility. The graduates are the first UCPS students to participate in the program, which will be rolled out in additional UCPS schools next year. 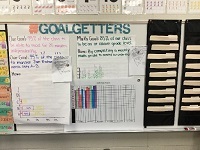 Students all throughout Union Elementary have been setting goals and working really hard to meet those goals. Students in Ms. Wheaton’s class have been setting goals since the first day of school, starting with reaching their reading stamina goal of 25 minutes! 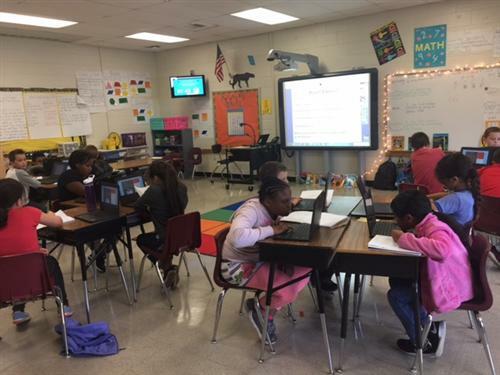 Recently our EC Resource Teacher, Ms. Reiland, and her students were able to get her Donors Choose project fully funded. As a result, they obtained a Hokki Stool and K'Motion Stool to be used as flexible seating options in her classroom. 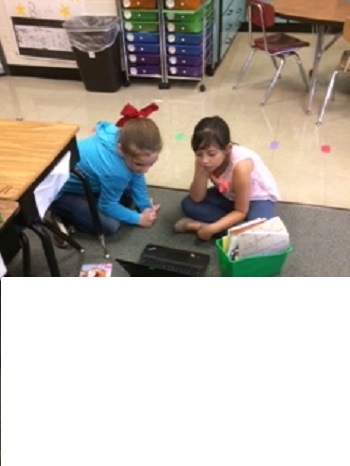 Last week saw classes buddy up with a class in another grade. This buddy relationship will go on throughout the year with different events joining the students together. Second grade enjoyed learning and reading fairy tale stories. They ended their unit using fairy tale problem solving STEM kits. 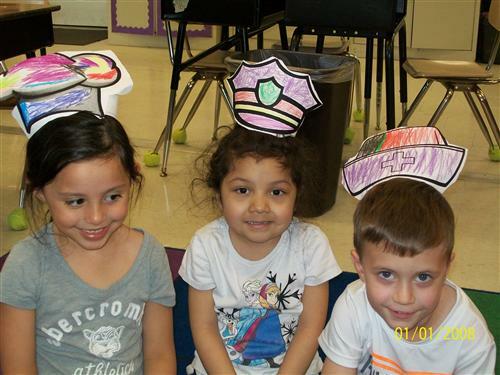 Pre-K celebrated Veteran’s Day honoring Fleet Marine Force Medical Corps Man Art Perez “Doc”, the parent of Mago Perez. Mr. Perez has served 27 years including 3 tours to Iraq. Mrs. Pope’s kindergarten class went to Discovery Place Kids in Rockingham, NC. While there, the students participated in activities that allowed them to explore real-life experiences. 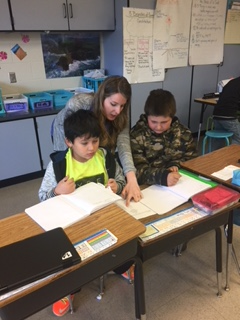 Fifth grade students have been studying Weather in their Science Unit, and are working on putting together their knowledge to create a weather forecast. Students used weather maps, weather instrument readings such as barometric pressure and wind direction to create a forecast of what the weather will be like tomorrow in cities around the country. This year, the children at Union are being exposed to the international game of cricket. It is a game played in over 100 countries and 6 continents around the world. 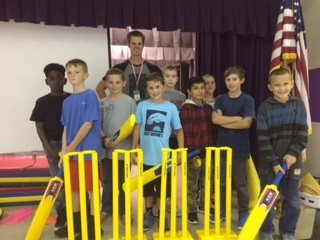 Last year's Global Committee were able to secure a donation from ZenBio, a biological firm based in Research Triangle Park, North Carolina, in order to buy 2 sets of Kwik Cricket; a modified version of the actual game in order for children to learn the skills needed for a full game. The playing of TAPS and lowering the flag at half-staff this morning by our 5th grade band director, William Harris, was in memory of those killed during the shooting in Las Vegas. It’s Fall Festival Time! Each Year, Union Elementary hosts this exciting event at our school. 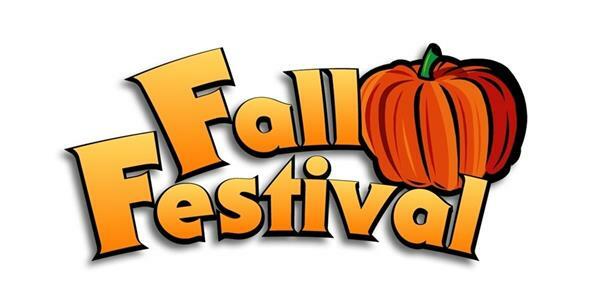 This year, the Fall Festival will be held on Friday, October 20, 2017, from 6:00 to 8:30 p.m. Everyone is invited to join us as we celebrate the fall season and raise money to help our school. The Union County Public Schools Employee of the Month Award recognizes employees in non-teacher/non-certified positions. Our September recipient is Beverly Chambers, lead custodian at Union Elementary. She was nominated for this award by her principal, Jennifer Deation. 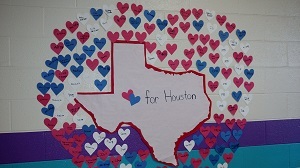 Union Elementary students have big hearts and show compassion for students in Texas! We held a week long fundraiser to collect donations to send to the Houston ISD Foundation. This will allow the school system to begin repairing from Hurricane Harvey's damage. Our students raised $320. Thanks for your support! 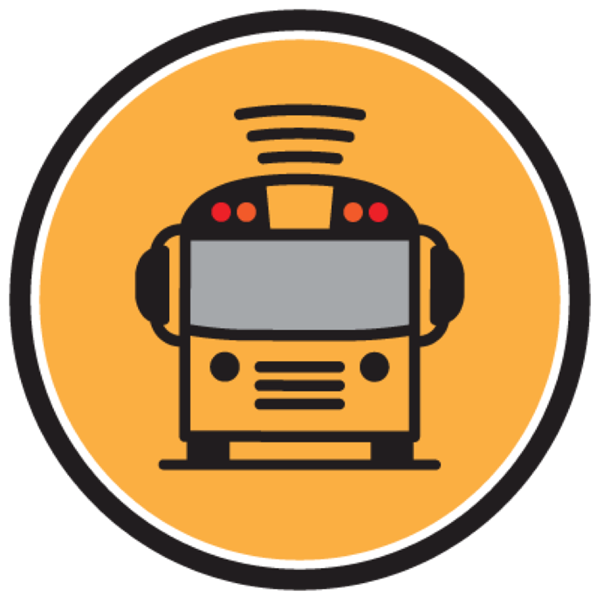 This school year, UCPS parents will be able to view the real-time location of their child’s school bus on their smartphones, tablets or computers. Union Elementary staff have been very busy today with beginning of the year staff development. Staff are getting classrooms set up and lesson plans ready for our amazing student return. 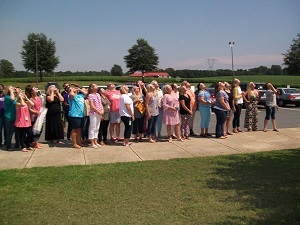 With all the excitement about the solar eclipse and the encouragement from Mrs. Mindy Pope, Mrs. Deaton provided all her staff with solar eclipse glasses. Around 2:40 this afternoon Union staff took the time to view the solar eclipse of 2017. Union Elementary staff have been attending training sessions this summer. Many of our staff have attended PBIS (Positive Behavior and Intervention Support and Reading Workshop training. 2nd Grade enjoys Why Not an American Ark? The 2nd grade students recently enjoyed the excitement of traveling the globe without leaving the Monroe area. Students visited Why Not an American Ark for the day. There they were able to interact with animals from the local area such as donkeys, cows, goats, geese and horses. But, the highlight was more exotic. The 4th grade class has been learning about animal adaptations and how these adaptations are used for survival. 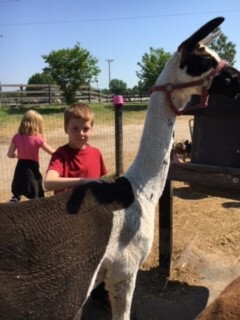 They have studied how the animal’s physical, or structural build, is connected directly to the needs of the animal. 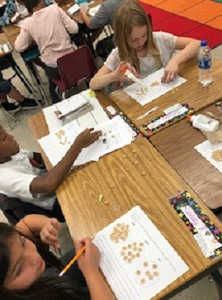 The classes have examined the various types of structural adaptations that exist and how animals often have more than one structural adaptation in place. Union Elementary has two online programs available for teachers and students to use to read books online. A Technology Night on February 7th provided information for parents about these two programs: RAZ Kids and myON. Students can access myOn at home. In AIG we have been working on developing our research skills, just as other 4th and 5th grade readers and writers do. However, with our curriculum in mind, we have these five generalizations of change that we keep in mind no matter what we are talking about. Mrs. Reeder's class is very excited about their new writing unit. They are learning to write opinions with detailed reasons. To make their writing more exciting students were able to bring in a collection from home. Students are enjoying writing about their collections. Students are placing their collections in order from their favorite to least favorite and giving detail reasons why they think this way. Mrs. Reeder's class is also learning about the opinions of others as they share their collections. December 16 was International Day at Union! The Kindergarten students in Mrs. Pope’s class had a great time learning about different countries!! The students visited Russia and made paper models of Russian nesting dolls. They also visited a room where they learned about clothing from around the world. Scotland, England, and China were some of the countries that were represented. Fifty-four U.S. schools have been named 2016 National Title I Distinguished Schools either for exceptional student performance overall, for significantly closing the achievement gap between student groups, or for excellence in serving special populations of students. 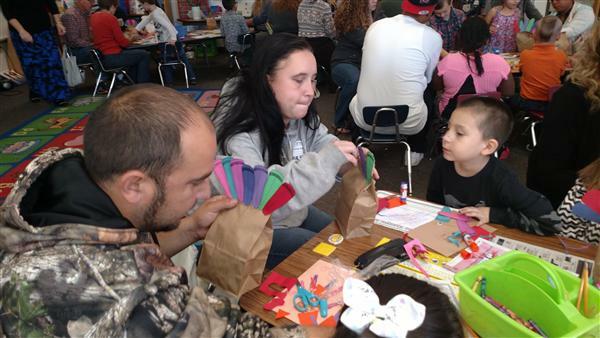 Kindergarten classes celebrated “Thankful Thursday” on November 17th with their families. This is a tradition that was started last year. Parents were invited to join their children for this special day. The students performed two Thanksgiving songs and then went to their respective classrooms to share their Thanksgiving cards, “Thanksgiving Dinner” books, and “I am thankful for…” letters with their parents. Did you know stacking and un-stacking plastic cups is an energizing, brain-activating and world-record-setting activity? On Thursday, November 17th, thousands of participants took part in what Guinness World Records® terms the “World’s Largest Sport Stacking Event.” During the course of Guinness World Records Day, sport stackers from all reaches of the world were up stacking and down stacking various pyramids in prescribed patterns at lightning speed for at least 30 minutes, all combined with a variety of fitness activities. Final numbers are about to be submitted to Guinness. As of November 21, the total was 558,558 stackers. 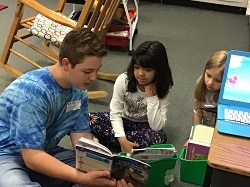 On November 1, 2016 Mrs. Schacht's class, combined with the other fifth grade classes, had a guest speaker who had traveled and spent time in Australia. 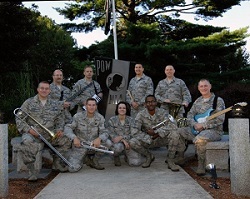 Mr. Harris is a band teacher who had traveled with a military band all over the world. One of his favorite places was Australia. 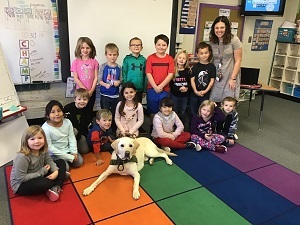 Students in Ms. Ross’ class were treated to some very special community helpers coming to visit her class including Allen’s Crossing fire department, Union County Smoke House and Forest Ranger Mr. Cranfill. Students in her class were learning about Fire Safety and prevention. During 2nd grader's first science unit, students have been studying how vibrations can make different sounds. They have explore sound waves and learned about the difference in a high pitch and a low pitch. Students have listened to animal sounds from around the world, all compiled into a “song”. They then had to listen and decipher each sound wave and decide which animal from which country made that particular sound. Third graders have been working hard in Social Studies. They have been learning the seven continents and the different oceans in the world. They were able to take a blank map and label all of the continents and oceans! We then moved into learning about different landforms. We choose one of the landforms to do research on. Students are researching Mount Everest, which is the tallest mountain on Earth and is located in Asia. Students will create a brochure with all of the information they learned through researching Mount Everest. 4th Grade students have been taking a global look of what is going on in the world around them by watching a daily children’s TV news broadcast. The 5 minute bulletins focus in on main headlines from all over the globe and also add in a few humorous or light hearted tid-bits with stories like a Peruvian penguin getting lost and finding themselves in someone’s kitchen, skateboarding dog, or a slow motion video of a controlled demotion. 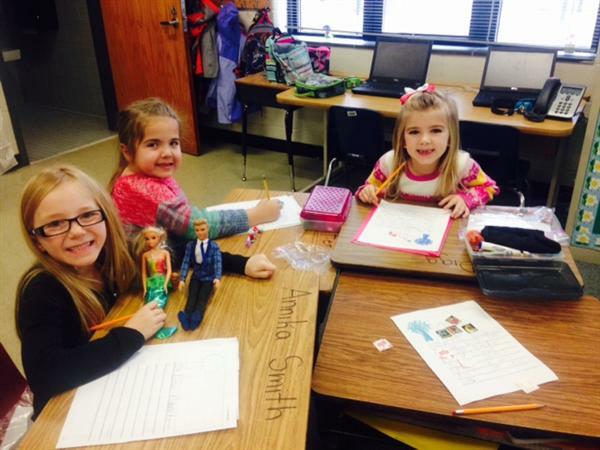 First graders in Mrs. Williams’ class have been learning about being a good citizen at school. They have learned that when you are a good citizen you follow the rules in the classroom and in other parts of the school, such as, on the playground and in the cafeteria. 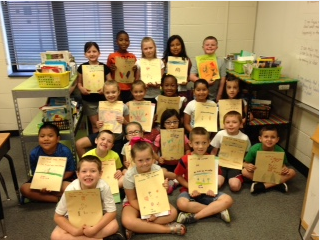 Mrs. Reeder’s class has enjoyed a wonderful year in first grade. We have read many books, learned many new things and made great friends. We created a memory book to help us remember our first grade year. We are so excited for summer vacation, but are sad for our year together to come to a close. We hope each of you have a wonderful summer. 5th grade band students in the Forest Hill Cluster meet only once a week. So they actually performed the concert with roughly 30 days of instruction over the 2015-2016 school year! They did an amazing job for the limited classroom instruction, and this was also the first time they played together as a one group instead of 4 different schools! The highlight of the evening was the band “trading 2s” with Mr. McFadden jammin’ on the trumpet. 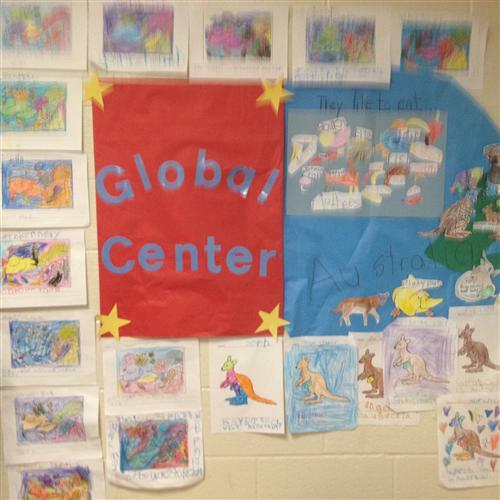 Third graders have been working on global studies. The continents we studied were Africa, Europe, and Asia. Students were put into groups and researched a country within one of the continents. They learned about the culture, food, school life, and how the people dress. 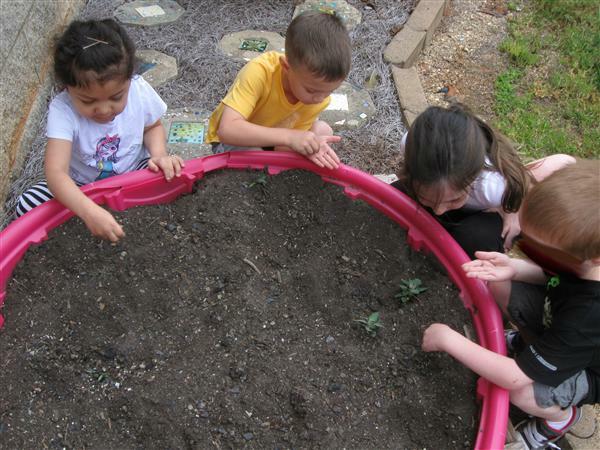 Pre-K students have been busy learning about planting. The kids showed interest in seeds keeping their fruit seeds found at lunch and picking dandelions at outside time. Ms. Ross brought in avocado seeds from home so students could talk about size of seeds. All seeds are not tiny. In fact students tasted Mango and saw the Mango seed was even larger than the avocado seed! 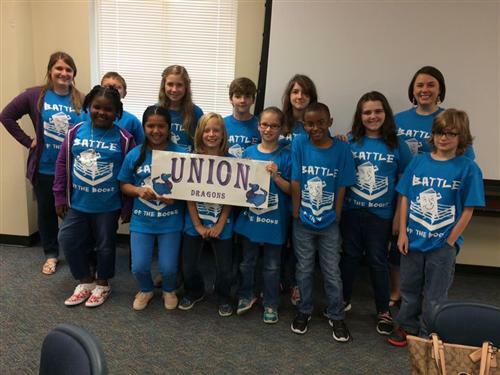 On April 21, 2016, seven elementary schools from UCPS gathered at the Professional Development Center for the first half of the County Elementary Battle of the Books Competition (EBOB). Union Elementary took 11 students on that day to compete. This is Union's second year participating in the competition and our students were excited and ready to go! 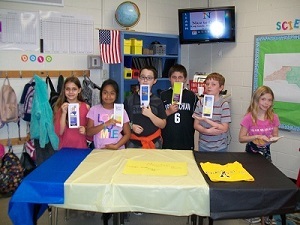 On Friday, April 15th, the 5th grade students at Union Elementary held a Living Museum for parents and students. 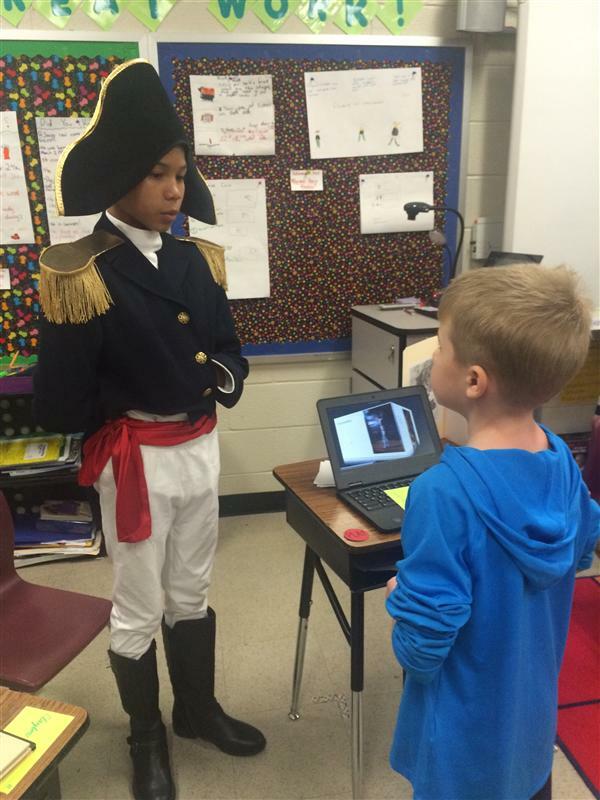 Each student chose a historical figure to research and created a presentation on, and then dressed up in costume as their chosen figure in order “come alive” as that person for their presentation. Historical figures of several areas were chosen, including Albert Einstein, Steve Jobs, Cleopatra, Amelia Earhart, and even Napoleon! 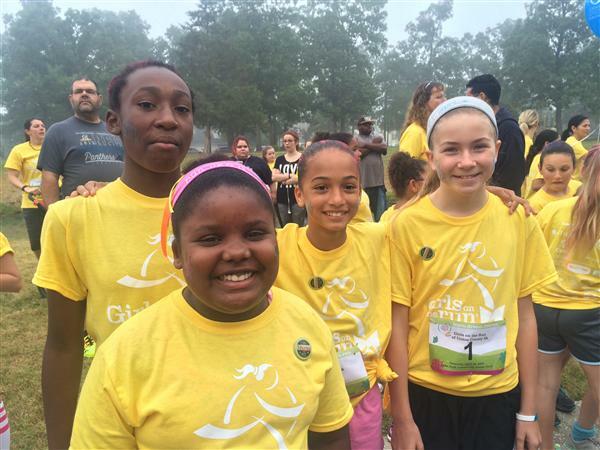 The Union Elementary Girls on the Run team competed in their annual 5K event on Saturday, April 30th at Lake Park. The event was held by Girls on the Run of Union County, and was complete with balloons, tutus, music, and a surprise master of ceremony, Sir Purr of the Carolina Panthers! During the study of weather Fifth Graders learned that the weather in North Carolina and around the world can be affected by El Nino. 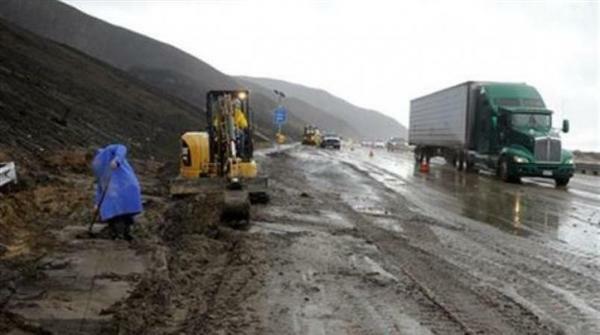 El Nino is the cycle of warm and cold temperatures of the water in the Pacific Ocean. Students at Union Elementary were treated to an assembly with Hugo from the Charlotte Hornets on Wednesday, April 20. Hugo’s House of Reading and the Book Bus made a stop to talk to Prek-5th grade students about the importance of reading. Hugo used the analogy of building a house and having a strong foundation; he also stated that reading was the window to the world. Mrs. Strickland’s & Mrs. Greene’s Kindergarten classes recently took a virtual field trip to South America. A virtual field trip built through the use of Google Tour Builder allows students to see different parts of the world as is they are actually in the specific place. During the Month of March our global studies have been focused on the continent of Europe. Each student chose a European country to research. The students accessed various websites to learn interesting facts about their country. During this process students read information about their country and created a newsletter. 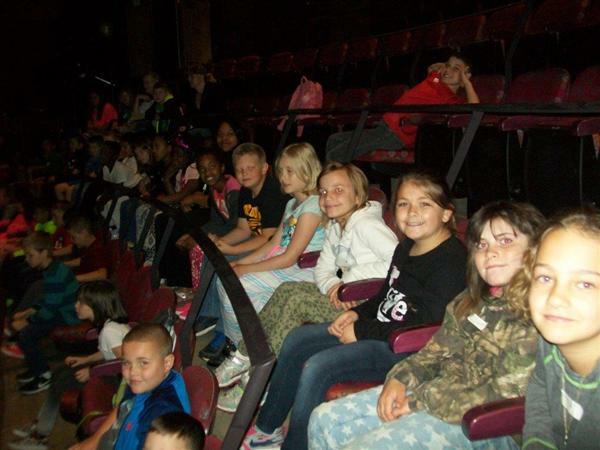 On Thursday April 7th third graders at Union Elementary School enjoyed an exciting rock concert at the Children’s Theatre of Charlotte! Schoolhouse Rock is a pop culture phenomenon! Students enjoyed a 70 minute rock concert featuring a live band with special fog effects and strobe lighting! Guidance classes have had a great time learning about careers in PreK, Kindergarten, 1st and 2nd Grades. Students have learned that a career is a job you are trained for and that you plan to have for a very long time. We have discussed traditional careers and how all of us work together in the community. Colonial Newspapers Are In Print! The time was the early 1800’s and the 13 colonies were in full swing. Immigrants from Europe had come to America to carve out a new life. Whether the colonists lived in a town or our on the prairie, they all had the desire to have a good life. 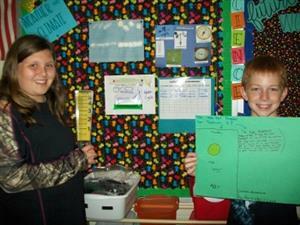 The students in Mrs. Schacht’s fifth grade class now know how the colonists felt and what they had to do to survive. First Grade Celebrates Dr. Seuss! March 2, 2016 was Read Across America Day and first graders at Union Elementary School celebrated in Dr. Seuss style. 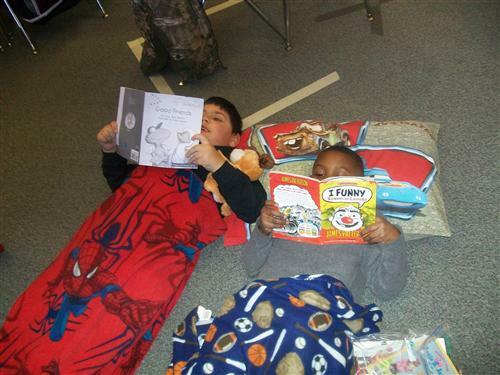 Throughout the day, we learned the importance and FUN of reading. Greetings, music families! 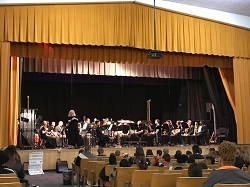 We are fortunate to have music as one of our ENCORE classes here at Union Elementary, and the month of March is National Music in our Schools Month! As teachers, parents, and students, we encounter music every day for many different reasons, and we are taking the time to demonstrate what music means to us. The Olympics were in town on Tuesday, February 23rd, just not the type you would think! 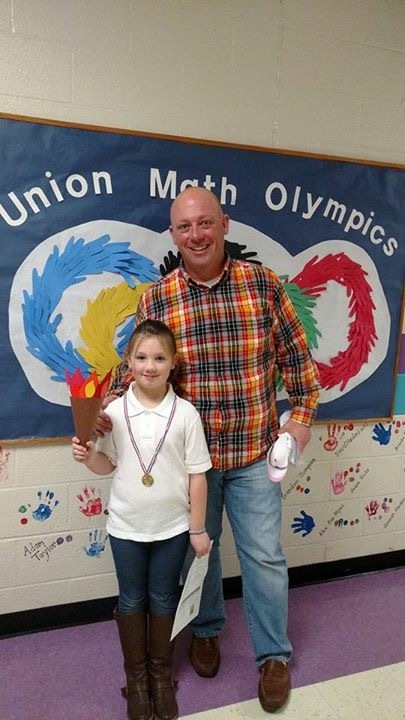 Union Elementary School held their first annual Olympic Math Night for parents and students. 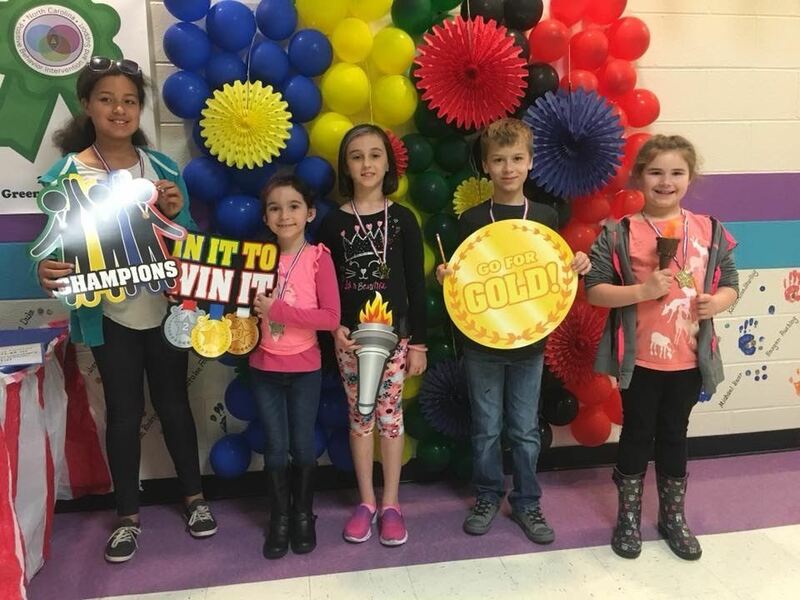 Over 70 mathletes participated in Olympic themed math games that were all aimed at providing fun ways for parents to support their children at home. Over 20 events were held during the evening. Students arrived at school on Wednesday morning proudly dawning their medals. The Union Elementary community is already looking forward to next year’s big event! Happy New Year! In February? Yes! Last week, Miss Marsh’s class learnt about the annual tradition held in many countries all over the world. The Chinese New Year is decided on the lunar calendar and so it changes each year, but generally falls around the end of January or the beginning of February and this year is the year of the Monkey! January and February have been busy months after returning back to school from our winter break. Band students have been passing off melodies for Band Karate, which is a series of songs that students have to pass off in order make the next rank or get that next belt just like in karate. Several students are working on their 4th and 5th belts! Third grade has been studying the life of Dr. Martin Luther King Jr. We have read many books on his life, examined timelines, watched educational videos, used technology to show our learning through Google Classroom and did art projects to help bring our learning to life. Students have not only learned about history but they have also learned how history effects us today. 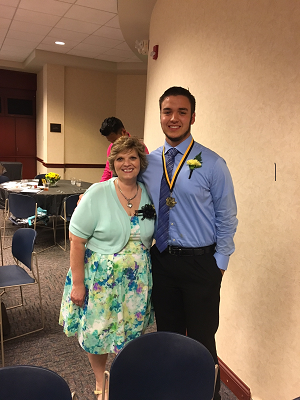 If you see students in the hallways with white sashes and pins on, those are the members of the Leadership Club. 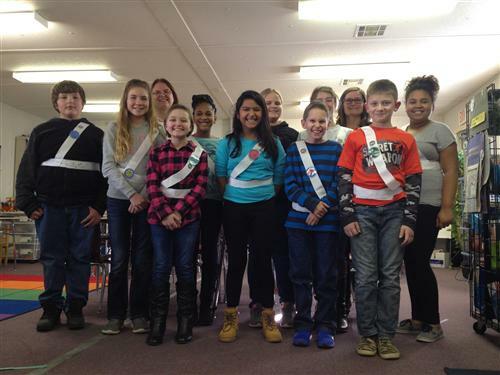 This year at Union Elementary School a Leadership Club was formed. What a helpful club it has been! Interested fifth grade students were asked to apply and write an essay why they would be a good leader for the school. Ten students were chosen and the club was formed! Every year 5th graders look forward to creating their own Native American habitat. Each fall the fifth grade studies Native American tribes of North America. In conjunction with class studies the student create a habitat of a particular tribe on their own The habitats go on display in the media center and during the fall PTO night parents can tour the displays. Miss Marsh's 4th Grade class often catches up on World events by watching Children's BBC daily news program, Newsround. It is a great resource for knowing what is happening in the world around us and for identifying where in the World these places are. Quite often the news program will ask its viewers for their opinions and feedback. Just before the winter break, Newsround asked what children would be doing on the last day of school. 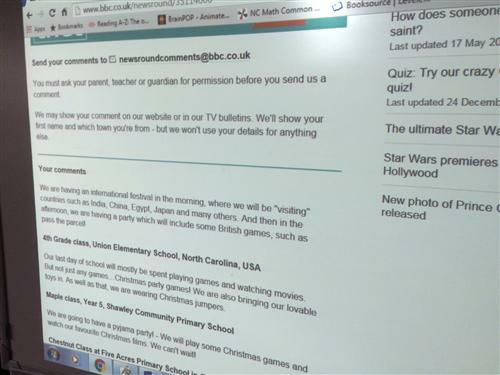 The class wrote in and their response was broadcast live on the evening bulletin and recorded on their webpage. Very exciting!! This year, Ms. Sheehan’s EC resource room has been traveling around the world! Once a month, 4th and 5th graders pack their bags to go to a new country! So far they have learned about Western Samoa, Portugal and Columbia. After learning so many new facts, the students compare life in United States to the new country. Students discuss the difference in food, weather, chores and school. They have found a lot of difference and similarities! The students are looking forward to their next trip! Congratulations to Lilly Trull, a fifth grader at Union Elementary, for being selected as the fourth place winner of the 2015 NC Bus Safety Poster Contest in the 3rd-5th grade division. The NC Pupil Transportation Association sponsors the poster contest each year to help remind everyone how important it is to follow the bus safety rules. Lilly has been presented with a certificate to recognize her accomplishment. 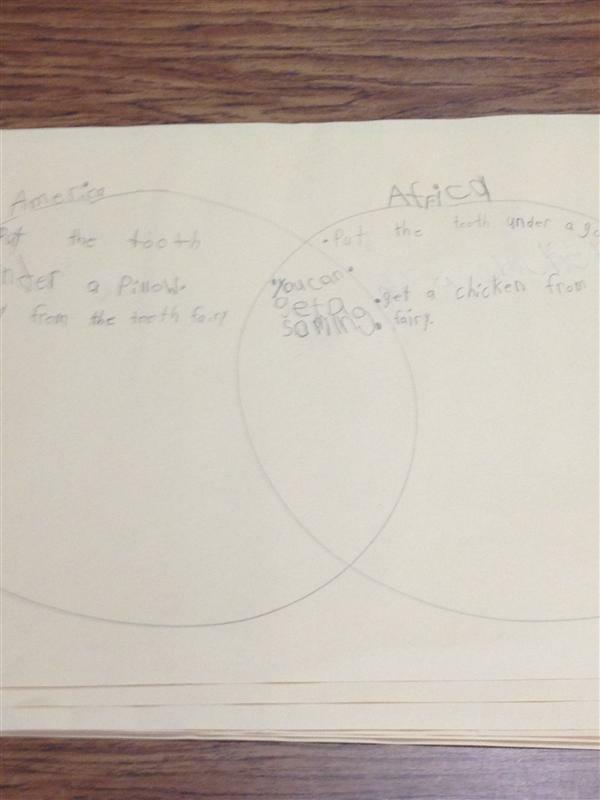 Mrs. Williams class learned about the cultures in Africa and compared it to their own cultures in America. They read the book, I lost my tooth in Africa. From the book, they learned that when you a lose a tooth in Africa you put the tooth under a gourd instead of under a pillow. And instead of getting money, the tooth fairy brings you a chicken! 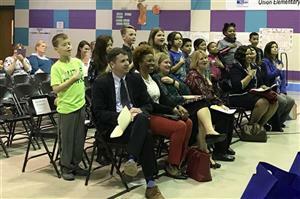 The NC Department of Public Instruction has announced that December will be a month-long celebration of National Board Certified Teachers. Union Elementary currently has 7 staff members that hold National Board Certification. Union Elementary received special gifts from Woodmen Life Chapter 70 in Marshville on December 9. Mr. Roy Thomas (President) and Mr. Toby Kiker (VP of Local Outreach) presented our school with more than 50 American flags ranging in various sizes. 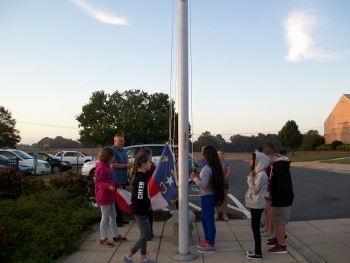 We received a new flag for the flagpole in front of the school, each teacher received a small flag to sit on her desk, and we also received new flags to hang on the walls of classrooms. During the informational writing unit, each of Mrs. Mangum’s second graders wrote a piece about a topic that they knew a lot about. Some of the topics included were farm animals, zoo animals, sports, and insects. The students collected artifacts, books, and factual information to help them demonstrate their expertise on their topic. As a culminating project, groups of students chose the topic that most interested them, to research and create a poster pertaining to it. The students worked collaboratively as they collected information to include on their poster. 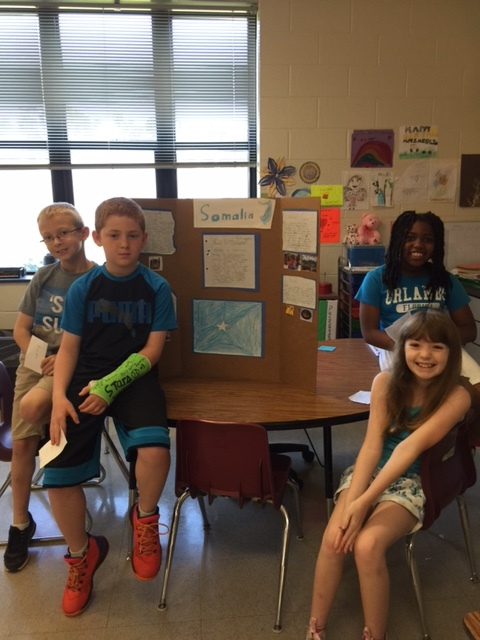 After each of the groups had completed their project, they participated in an “Expert Fair”, sharing their presentations with the class. The students definitely proved that they were EXPERTS on their topics! 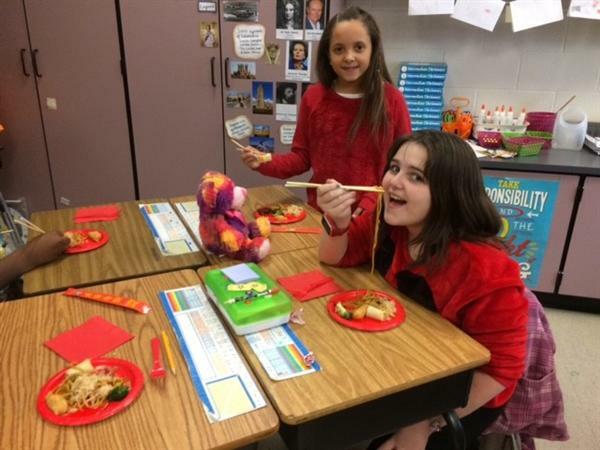 All elementary schools are part of the push to have students early on deepen their understanding of the culture of other countries in the world. This builds an interest in learning about the whole world. Students can now begin to understand their significance in the world. When international events happen they can start understanding that we are all citizens of the world. Today’s students will begin to comprehend our connection to sustaining a peaceful world. AIG students are creating Environmental Projects using all recycled materials. Fourth and fifth grade AIG students recycle on Thursday mornings. While collecting Union's recycled materials they have been collecting a few materials for their own inventions. Students have created cat boxes, water cans, table pong, a chandelier and more. Here are two inventions. The spirit box is a speaker system created by Lily Trull in which a cell phone fits into the tube and the plastic jugs work as speakers that amplify the sound. The second invention is created by Evan Greene. It is an "E" model that is a system that holds your book on your lap, it has a pencil sharpener and a small white board to take notes. They have shown create ingenuity in their creations. 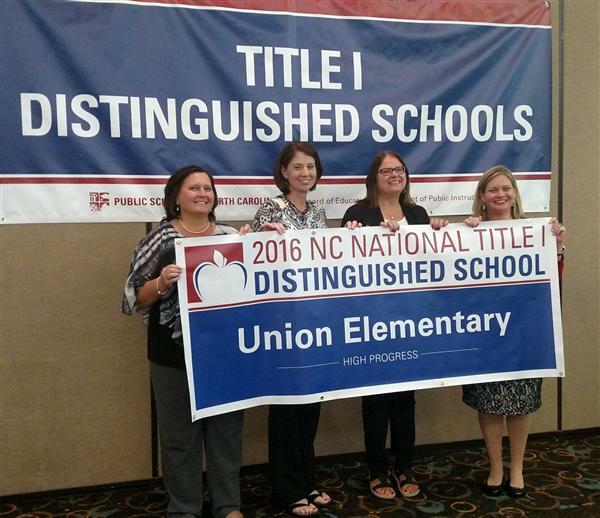 Union Elementary goes from "Global" School to "International"! Students are VERY excited about the award! They worked so hard completing global lessons, research, creating artifacts and participating in the international global festival. 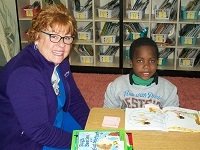 This year Union Elementary is studying one continent per month. In October the school has been studying about Australia. Parents be sure to ask your student about their global studies. October 4 – 10 is fire prevention week. On Monday, October 5th Union’s second grade classes got a visit from two very important people to remind us why we all need to be safe with fire. 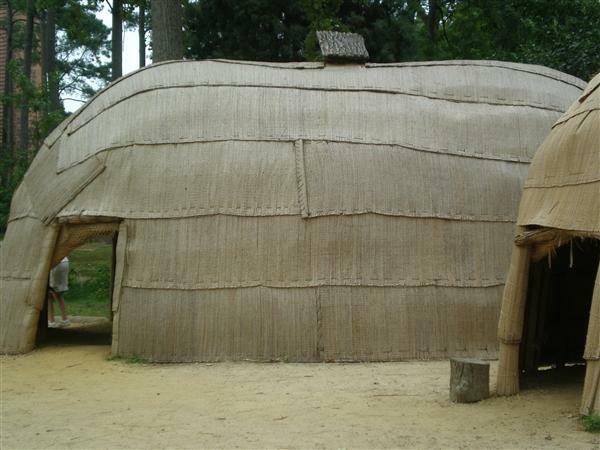 Ms. Borbas’ class has traveled back in time to about 12,000 years ago to begin their journey through history to present day North Carolina. They began by using some imagination to envision what the land surrounding us was like. Kindergarteners will be learning a lot during this new school year! One of the ways Kindergarteners learn best is through center work. During the Reader’s Workshop block of time, Kindergarteners will be engaged in learning through the reading, writing, alphabet, listening, science and global centers. Coming back to school saw lots of people chatting about what they had been up to during their summer vacation. Many people recollected amazing day trips to local places and some were regaling stories of journeys far and wide. We collected some information on where the staff of Union Elementary spent their vacation and we managed to cover 19 states and 4 countries over 2 continents! 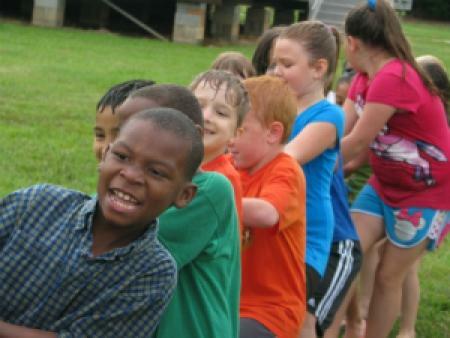 On Friday June 5th Union Elementary students had a blast celebrating Fun Day with all of their classmates! Put together by our wonderful PTO, Fun Day consisted of a variety of indoor and outdoor games and activities, including a scooter race where students had to balance pizza boxes, tug of war competitions, “Singin’ in the Rain” musical chairs, and even a dance party complete with a DJ and bubble machine!